Can a Third Party Win the Presidency? The Democratic Party isn’t. The party bosses have fixed the 2016 primaries to ensure the nomination of Hillary Clinton, who combines the ethics of Richard Nixon with the charm and good looks of…Richard Nixon. Meanwhile, the Republicans are demonstrating why democracy is not always a good idea. Is Donald Trump a supervillain or does he merely play one on TV? Enquiring minds want to know. And so interest in third party alternatives has exploded. Hundreds of people are checking out the new party manual on the main site. And this is good — in the longer run. But alas, it is rather too late to get a new party together, select a candidate, and put him or her on the ballot in enough states to make a difference. A super strong celebrity write-in candidate might win a state or two, but it is a real long shot. There is a less risky option: Gary Johnson. For a change, the Libertarian Party has a Presidential ticket that has more experience, and is more mainstream than the Republican ticket. 2016 is a strange year. It isn’t likely, but it is quite possible. Gary Johnson could well become the next President of the United States. This may sound like wishful thinking. After all, Libertarians typically have a hard time breaking 1%. But this is not a typical year. National Review devoted an entire issue to damning Donald Trump. It’s rather late for them to back out, and I cannot imagine them endorsing Hillary. And yes, it didn’t take me long to find an article recommending Gary Johnson. Red State has multiple writers making the case for Johnson, and the articles are getting featured on the front page. George Will left the Republican Party over Trump. Jeb Bush and Mitt Romney have both said they will not support Trump. Romney said he could support the LP VP candidate, William Weld, and he left open the possibility of endorsing Gary after he learns more. Quite a few Republican state legislators have endorsed the LP ticket and some have switched party. This just in, the first Republican U.S. Congressman has endorsed Johnson. Marijuana legalization is an idea whose time has finally come. Disgust with failed military adventures and an out of control security state is high. Black Lives Matter is drawing attention to the horrors of the Drug War. Bernie Sanders has drawn young social liberals into the political game, but many are not ready to vote for Hillary. 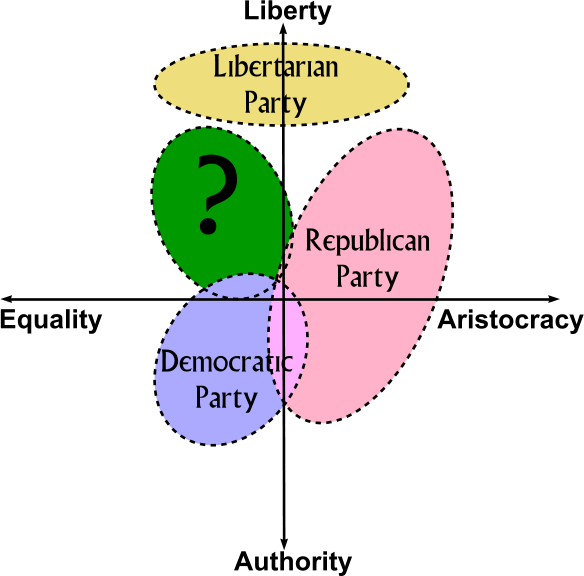 Years ago I theorized that the real sweet spot on the Nolan Chart was not pure libertarianism, or even moderate libertarianism. 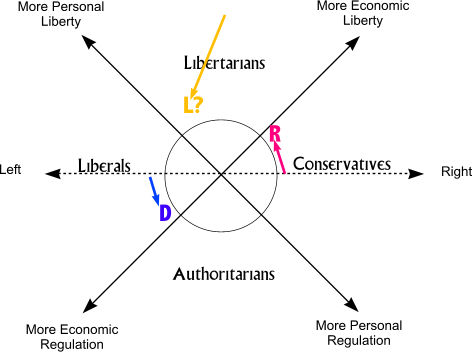 The real sweet spot is somewhere near the border between libertarian and social liberal. Under Bill Clinton the Democrats downplayed civil liberties in favor of harsh law-and-order measures. Meanwhile, the Republican have become ever less socially conservative. Rush Limbaugh is no prude, William F. Buckley favored ending the Drug War. But perhaps I jumped the gun. The few candidates who followed my advice didn’t do as well as I’d hoped. The civil libertarians I was trying to reach were more concerned about the wealth gap, big corporations and the environment. But this year is different. Civil liberties are a major concern and the Johnson/Weld campaign is taking full advantage of the fact. The campaign is triangulating aggressively, making more efforts to go after the burned Bernie voters than the Never Trumps. The campaign might be over doing it, and thus lose the Never Trumps. They have made statements on abortion, religious freedom [the wedding cake issue], and Supreme Court picks that have me thinking about voting for Trump instead — but radioactive fallout gives me a terrible rash, so I won’t. The good news for Johnson is that Establishment Republicans are used to compromising. And many of the economic conservatives are not all that socially conservative to begin with. Their social conservatism is often more a matter of team spirit. 3. Has the Johnson Team been reading this site? As I wrote above, to really get the attention of the social liberals, you also need to be green and egalitarian. Governor Johnson is an avid outdoorsman, and has even been featured in Outdoors magazine. And yes, he has consciously deviated from libertarian orthodoxy in order to protect the environment. Surprisingly, he has also stated a willingness to consider a carbon tax and a universal basic income! If the campaign were to go all in with these positions it could well end up in the sweet spot in the liberty-equality plane. It is almost a dream come true. In this age of social media, eyeballs trump ad buys. Ironically, the supposed billionaire Donald Trump has paved the way here. The mainstream media want eyeballs and thereby got used by Trump. But the mainstream media do not want Trump to be President. So this year they are giving the LP ticket at least an order of magnitude more attention than is usual. Have a look at these articles in Time, Esquire, Chicago Tribune, New Yorker, and the Orange County Register. This is not a complete list. And, by the way, CNN hosted two townhalls for the Johnson/Weld team. Gary Johnson does not need a majority to win. He does not even need a national plurality. A plurality in just a few states may suffice. If Trump and Hillary are evenly split, just a few electoral votes going to Johnson could send the decision to the House of Representatives. If so, the House votes by state delegation. Utah and California each get one vote. Since the Republican Party is now the rural party, the Republicans will have an overwhelming majority unless Trump has some incredibly negative coattails. The House Republicans may well snub the Republican Party nominee. The Donald has insulted the Republican Establishment repeatedly, including Speaker Ryan. House Republicans could very well vote for Johnson instead, in the name of sanity and national unity. Ten years ago I led an attempt to reform the Libertarian Party to make a campaign such as this possible. I thought I had failed, and so left the party and have taken a break from active politics. It is still not clear to me that the LP could build on this year’s success. I see a lot of grumbling from LP stalwarts about Johnson not running a libertarian campaign. If the ticket doesn’t win, there could well be a purge similar to what happened after the 1980 Clark campaign. But even if the ticket does win, I’m not convinced the LP could absorb a combination of Never Trump Republicans and Bernie-loving social liberals to build a lasting coalition. The party rules and culture are designed to prevent such. A split would be likely. I could be wrong, however. The Rothbardians could wake up and realize that they have a bigger megaphone for their ideas by being the vanguard of a broader coalition than by running an exclusive philosophy club. I won’t hold my breath. Those of you interested in starting yet another third party should probably proceed. But for this year, you might want to support Gary Johnson. I will.